THIS SMALL GROUP SOFT ADVENTURE TOUR COMBINES THE BEST OF CAMBODIA & LAOS WITH ALL THE MUST-SEES THESE TWO FANTASTIC NEW DESTINATIONS HAVE TO OFFER. It comes in two options of tour 22A for 15 days or tour 22B for 21 days. TOUR 22A: A$2,450.00. S/S; A$1,350.00. TOUR 22B: A$2,990.00; S/S A$1,790.00. Starting in Bangkok the 15-day small group adventure tour package then heads to the Cambodian super highlight of Angkor Wat before the capitals of both countries plus some lesser travelled roads before finishing in the Laos super highlight of Luang Prabang. 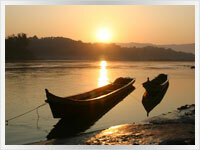 Continue on for 21 days and see another 3 smaller towns in Laos along with a Mekong river boat trip. Then finish with two nights in Chiang Mai to party, sightsee, shop or just relax by the pool. One domestic flight is included and the longer tour 22B itinerary also includes a flight back to Bangkok. 22B x 20 nights = (3 star hotels x 11 nights, 2 star hotels x 9 nights). Killing Fields and S21 Museum, (half day). Wat Phu Champasak, (half day). A & B.Tonight our Cambodia & Laos combination small group adventure tour package will stay in; BANGKOK - Our Cambodia & Laos small group tour officially starts when you check into our Bangkok riverside hotel. A welcome dinner will be had in the evening. D.
If you arrive early enough your free time could be spent visiting the enormous Chatuchak weekend market and/or, Wat Phra Kaew Emerald Buddha & the Grand Palace, Wat Pho, Wat Arun, MBK or Siam shopping centres or take a boat ride with the locals on the Chao Phraya Express to some local shops/markets in Nonthaburi. Tonight our Cambodia & Laos adventure holiday will stay in; SIEM REAP - Our group tour will have a long but interesting days travel today. Firstly by bus to the Thai border town of Aranya Prathet. After completing immigration duties in Poipet we will travel on the much-improved roads to Siem Reap. Late afternoon we will visit Angkor Wat for the sunset views. B. 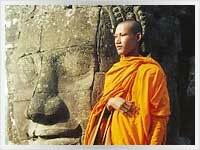 Apart from the main Angkor Wat complex, you will also visit the Bayon, Tha Prohm and Angkor Thom. B.
SIEM REAP - A free day to wander around Siem Reap. The Angkor National Museum, War Museum, House of peace association or the Kmer ceramics centre. A number of temples include the oldest of Wat Bo. Siem Reap has some great shopping opportunities these days also. Souvenir overload at times. Shops set up to benefit the blind, disabled and other worthy causes include Krouser Thmey, Nyemo,Rajana, Rehab Craft, Sentaurs d'Angkor and Tabitha Cambodia. These shops sell a variety of goods which include silk products, arts and craft, clothing, wallets, bags and the like. As its name suggests, Pub street provides exactly that, especially in the evening. Local market food or upmarket restaurants just add to the appeal. B. NOTE: If you want to spend further time visiting some of the more remote temples of Angkor we will be happy to arrange this for you as an optional extra at your expense. Tonight our Cambodia small group adventure tour package will stay in; PHNOM PENH - Today by bus our small group tour heads to the hectic Cambodian capital of Phnom Penh on another much improved road. No meals. A visit to the Killing Fields of Choeung Ek where the Khmers have made fantastic efforts to come to terms with their recent history. Then to the just as infamous S21 which is now Tuol Sleng Genocide Museum. Here you can view 100's of black and white photos Pol Pot's regime took both before and sometimes after torturing his victims. This experience will stay with you forever. You will come away with far more compassion and concern for your fellow man. B.
Tonight our Cambodia & Laos adventure holiday will stay in; KRATIE - Today is the first of two long but fascinating days travel towards Laos. Firstly to the Mekong riverside town of Kratie, (Kra chee). This is a great town to break the long journey to Laos. 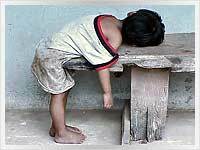 Enough of the day will be left to get an insight into rural Khmer life. B.
Tonight our Cambodia & Laos tour package will stay in; PAKSE - Some patience will be needed today as the no rush local culture really kicks in at times. A long days travel will see us arrive in the large southern Laos city of Pakse. A far lesser known but still a Laos highlight destination. Pakse has some of the best feel-good vibes in all of Laos. As laid-back Laos as it gets with a Beerlao and some great restaurants always close at hand. No meals. PAKSE - Pakse now has a bridge over the Mekong to Thailand meaning it has grown into a bit of a trading town also. But with the usual Laos laid-back style it also makes for a more than relaxing stay. Possibly the chill out capital of Laos? But only forty six kilometres out of town is the reason so many tourists now arrive in Pakse. UNESCO World Heritage-listed Wat Phu Champasak is another highlight of Laos. This fifth century Khmer religious complex is tiny in comparison to the Angkor kingdom but is no less intricate in design. A tour of the temple is included today. Last but not the least Pakse has great restaurants with one in particular, in our opinion, being one of the best restaurants in all Laos. Daolin has a huge choice of Thai, Laos, Western and Vietnamese food on offer with the Vietnamese curry noodle salad being one of the tastiest choices, to begin with. B.
Tonight our Cambodia & Laos small group adventure holiday tour will stay in; VIENTIANE - After those long travel days we will now have an easy day with a short domestic flight that will see us in the most laid-back capital city in all S.E. Asia of Vientiane. B.
Sightseeing begins with a short Jumbo ride to the most important temple in Laos of Wat That Luang. Then the Arc De Triomphe look-alike of Patuxai, Lao National Museum or enjoy a drink at the central Fountain Circle. Don't miss the Morning Market, (open all day), which today resembles a shopping mall rather than the wet market of yesteryear. Tonight our Cambodia & Laos group travel tour will stay in; VANG VIENG - A shorter bus ride today will see us in the scenic town of Vang Vieng for an overnight stop to break up the long trip to Luang Prabang. There will be enough time on arrival to explore this very active little town with the stunning karst scenery as a backdrop. B.
Tonight our Cambodia & Laos group adventure tour package will stay in; LUANG PRABANG - By bus again today with some stunning scenery along the way will see our Cambodia & Laos group tour in the wonderful UNESCO World Heritage City of Luang Prabang. The best way to see Luang Prabang is with a leisurely meander. WHERE TO START? Just about anywhere as Luang Prabang is one of the great travel destinations in Asia today. First up, while you still have the energy, try walking up the hundred or so steps to Phu Si Temple with fantastic views as the reward. Massage and Spa's are another way to enjoy Luang Prabang for the not so energetic. Markets and other great eateries will see you get enough nourishment to complete the task at hand whatever you decide on. Dinner by the Mekong with a Beerlao being the perfect way to finish the day. B.
UANG PRABANG - A half-day tour with a local operator today will include a trip on the Mekong to visit the spiritual caves of Pak Ou, beautiful Kuang Si waterfall and a local village or two among other interesting places. B. TOUR 22A: Our Cambodia & Laos small group adventure tour package is officially over after we check out of our Luang Prabang accommodation. An airport transfer is also included. B. Maybe better to continue on with the others though rather than being envious of them as we say your goodbyes. TOUR 22B: YES! WOW! Another free day in Luang Prabang to further enjoy this highlight of Laos. B. Back on the road today will get us even further on the baktrax into rural Laos life for a real local experience. Not much infrastructure for tourists in Udomxai so meals may be limited to real local dishes with a limited choice of these as well. Just another fascinating laid-back Laos town for a chance to see how the locals live. B.
Tonight our Cambodia & Laos small group adventure tour package will stay in; PAKBENG - A much shorter bus trip will see our group tour with the locals again in Pakbeng well before the tourist hordes arrive by boat and after the previous lot have left with enough time to explore this very scenic riverside town with very few tourists in sight, until the next lot boats arrive again later in the evening. With all the tourists coming and going on a daily basis lots of restaurants and French bakeries have sprung up so those suffering from the dearth of choice in Udomxai will have smiles on their faces once again in this regard. Some of the biggest croissants you will ever see in little Pakbeng among other sugary treats. No meals. Tonight our Laos Cambodia & Laos group adventure tour package will stay in; HUAY XAI - This morning we will board a usually far less crowded slow boat as we head upriver against the regular tourist tide going down river for a fascinating days travel along the magical Mekong. The scenery is spectacular as we watch the locals going about their daily river life also. As well as travelling against the down river tourist flow we will also avoid the hordes by staying the night in the Laos border town of Huay Xai meaning a much more charming and compact town than it's Thai counterpart across the river. No meals. Tonight our Cambodia & Laos small group adventure travel will stay in; CHIANG MAI - At leisure, we will travel back across the border to Chiang Khong where after immigration duties we will continue on by bus on a long days travel. The reward for this will be Chiang Mai for two nights of relaxation or anything else this wonderful city has to offer. No meals. CHIANG MAI - A totally full day to do as you please in Chiang Mai. For Shoppers, it doesn't get much better than Chiang Mai. After a day at Kad Suan Kaew Shopping Centre, Worowat Market, Airport Plaza and/or dozens of other speciality shops all over the place you can barter hard at the famous Night Bazaar. Arts and crafts, textiles, silver and clothing are but a few of the great bargains to be had in Chiang Mai. Some time poolside may appeal to some also or even a budget trip to a dentist is another possibility. B. Our Cambodia & Laos small group adventure tour package is officially over when we check out of our Chiang Mai accommodation. A flight to Bangkok is also included to return you to Bangkok where we began and your onward travel plans. B. Maybe even add another day or two in Chiang Mai for a bit more relaxation and discovery. Cambodia & Laos can be tiring at times with the lack of infrastructure, the no rush culture and the extra excitement so an extra buffet breakfast or two and poolside after that wouldn't do any harm.